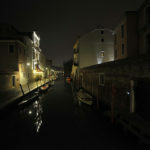 More magic than Venice is only … Venice by night. Especially with your running shoes on. The “floating city” is really unique in the world and a great way to discover and appreciate its charms, that really take your breath away, is to follow our locals’ tips. Venice has been developed from urban settlements in tiny islands where small communities living there had no difficulty in orientation. Today it is made up of over 120 islands connected together by bridges built over the centuries: they give origin to today’s road system that by “foreigners” (in Venice anyone who is not originally from the Venetian lagoon) has often considered a labyrinth. Getting lost in Venice is undoubtedly one of the most suggestive ways to visit it. And what easier opportunity to put in practice if not in the night, when the little light facilitates the success? The network of public lighting of the streets of Venice has its origins in the ‘700 with the installation of oil lamps, later replaced by gaslamps during ‘800 and electric lighting in the early’ 900. Before that public lights in the city were limited to a few narrow streets and dangerous when it was planned to install lights and cesendelli mostly near capitals and religious buildings. In the fifteenth century, as a result of an increase in the number of night crimes, the Venetian Republic made mandatory to people traveling late at night using a light burning: the nobility, rather than taking along candles and lanterns, preferred to pay people for guiding them in the night with a light, and so was born the figure of Codega, a “guide” waiting outside the “Ridotti” (game halls frequented by nobles) for customers to drive home. Even today that public lighting is more extended than in the past, the light is always discreet, never aggressive, almost not to disturb the harmony and tranquility that characterize the Venetian nights. With the darkness, the city losts the frenetic rhythms and the voices of the common people running through it daily and becames quiet and intimate: the ideal atmosphere to enjoy a nice run! Start with the sunset. Go to a place with an open view like St. Mark’s Square and admire the magical light of the sunset reflected in the water. If the weather is benign and the sky is clear stay there until the darkness comes and enjoy the starlight and the moon mirrored in the large basin of San Mark. Then return to run along the Riva degli Schiavoni, the final kilometers of the Venice Marathon, until you reach the entrance of the Arsenale, the ancient shipyard where the fearsome ships of the Venetian Navy were built. The absence of cars and people leaves the city surrounded by silence. Away from the Grand Canal, you will just hear the sound of the waves caused by the rowing boats and by your steps and sometimes you will hear also the cheerful voices of people coming from the Venetian pubs, the actual rally point of the Venetian night-life. Next to you the water of the Lagoon: while the sunlight turns into the darkness, enjoy the play of the soft lights reflected on the water. Now go to a “Fondamenta” in front of the open lagoon, close your eyes and breathe deeply: here is the lagoon, the scent of Venice. And now restart your running session along the Fondamenta, between the warmth accumulated during the day by the paving stones and the cool breeze of the lagoon. The city is a kind of safe haven where is very common wondering in the night. Just sometimes pay attention only on the “Masegni”, the paving made with trachyte blocks, the most common materials used since the XVI c. to build the Venetian flooring pedestrian paths, and on the steps of the bridges. Another magic moment to run into the town is from the sunset to the dawn: trust our running leaders, they will be your guide through the city! 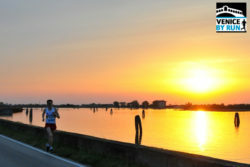 Stories by run is a weekly column written by Venice by Run for the VMC – Venice Marathon Club events magazine.